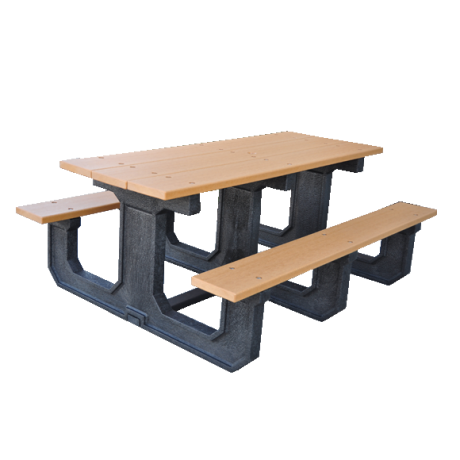 These environmentally friendly recycled plastic picnic tables are made from 100% post consumer plastic (milk jugs primarily) which keeps the Earth and your wallet green! After the post consumer waste is collected, the milk jugs and drink bottles are separated from the rest of the scrap. 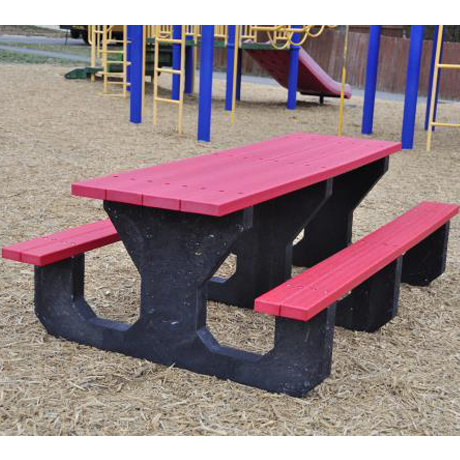 After cleaning and grinding, the recycled plastic material is extruded into plastic lumber or molded into table bases. 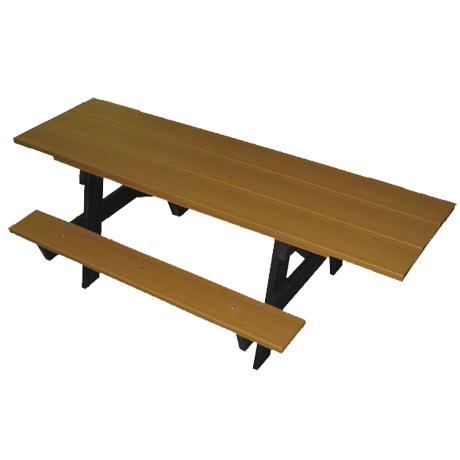 None of our recycled plastic furniture has fillers (like sawdust or organic fibers) in the plastic. 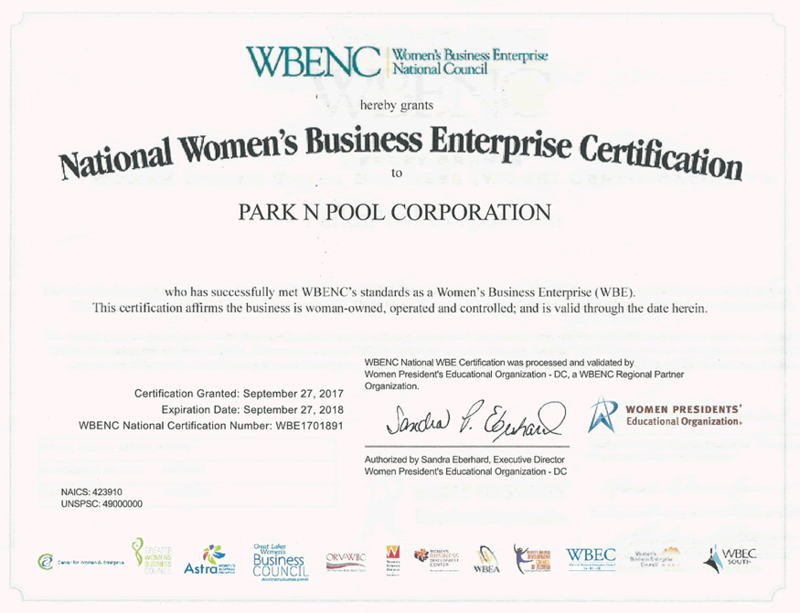 Our plastic is pure, and does not absorb water or dirt. It cleans and sanitizes completely. 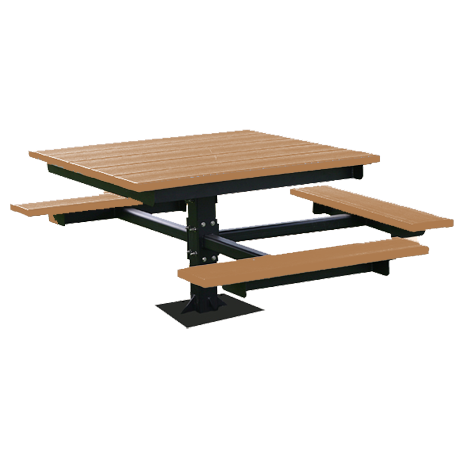 That makes it an ideal product for food service, cafes, and schools. 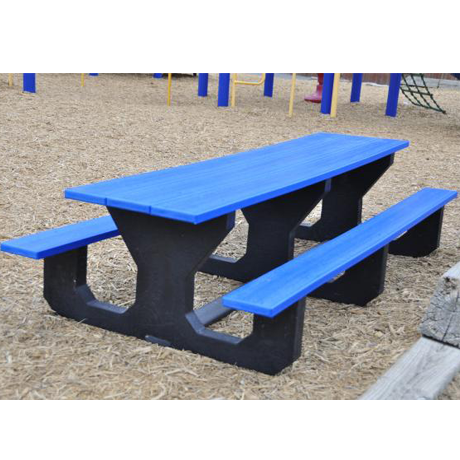 Tops and Seats are made from 100% Recycled Plastic. No sawdust or fillers are added to cheapen the product. The post consumer plastic is put through the best 3 step cleaning process. The extruded recycled plastic lumber is solid all the way through. The UV stabilized colors are added before the extrusion process. 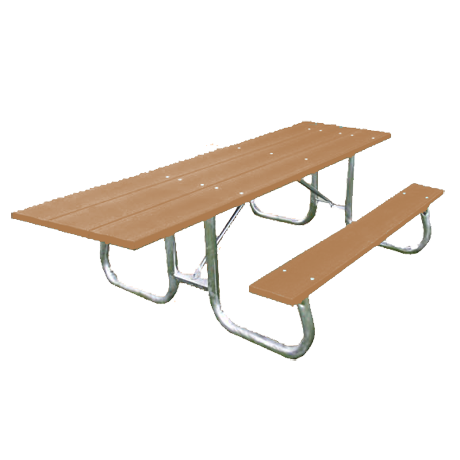 It takes 6300 milk jugs to make a 6 foot picnic table. 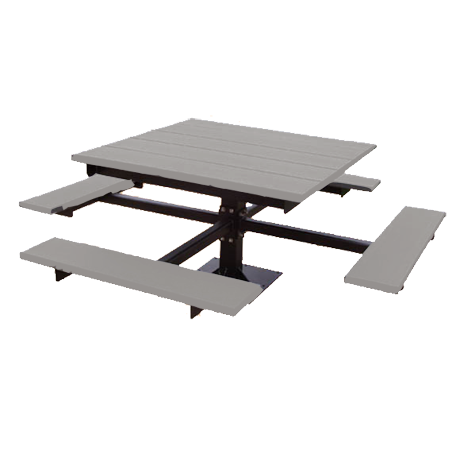 Don’t worry about your picnic table splintering or the paint peeling - the planks are solid and the color is uniform throughout the lumber. No painting needed! 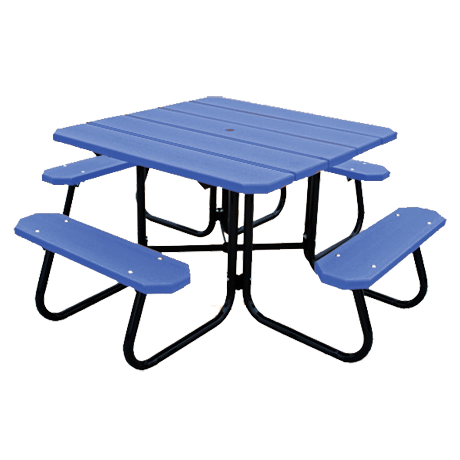 Unlike other recycled plastic picnic tables, this plastic has no added fillers, which can absorb moisture and harbor bacteria and mold. 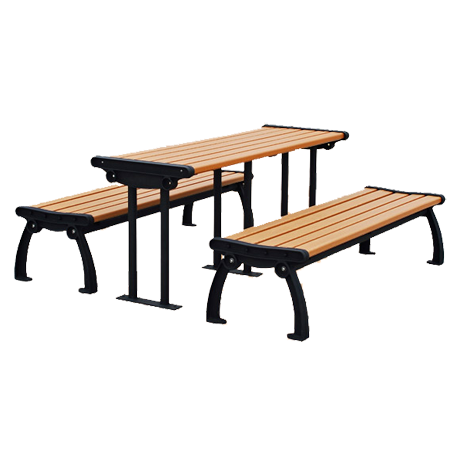 The plastic in these tables is impermeable, so they will definitely stand up to nature and the public! 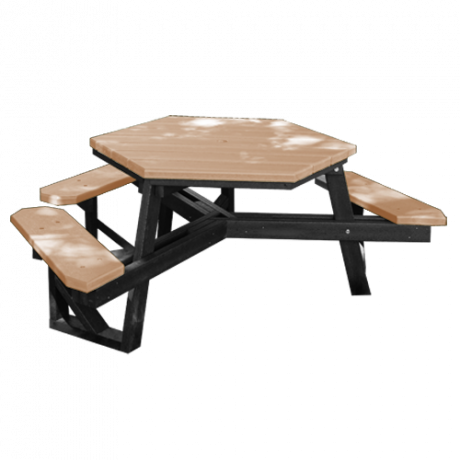 The outdoor dining tables are easily cleaned, making disinfecting and graffiti removal virtually effortless! 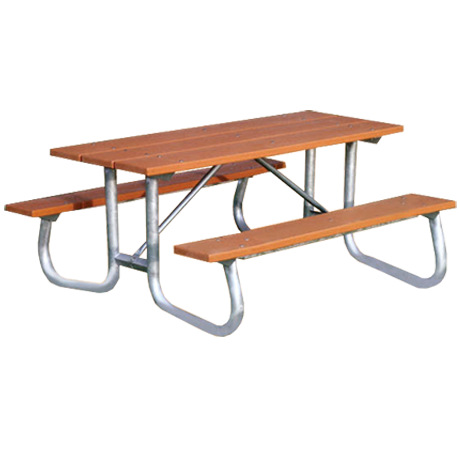 These outdoor picnic tables will not decay and are uninviting to insects, which allows for a long and worry free life. 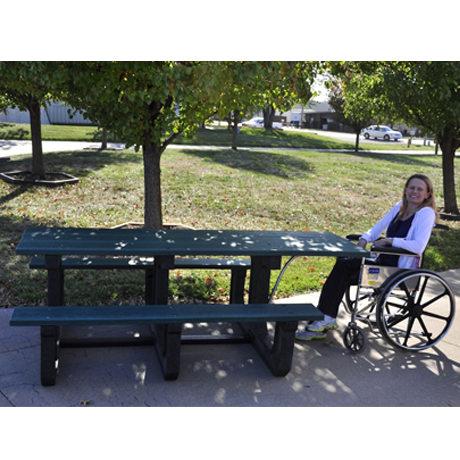 Be sure to consider matching Recycled plastic park benches and trash receptacles and recycling bins to complete your outdoor park area. 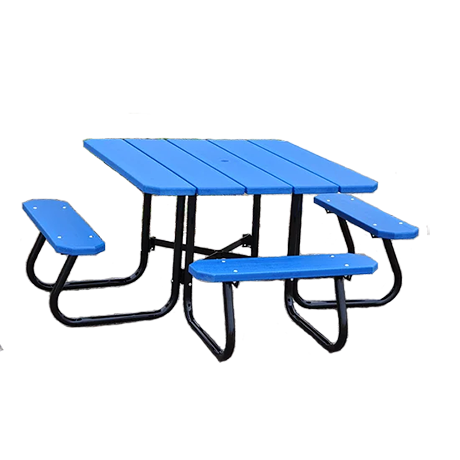 Also available are recycled plastic picnic tables in kids sizes for daycare and elementary schools. 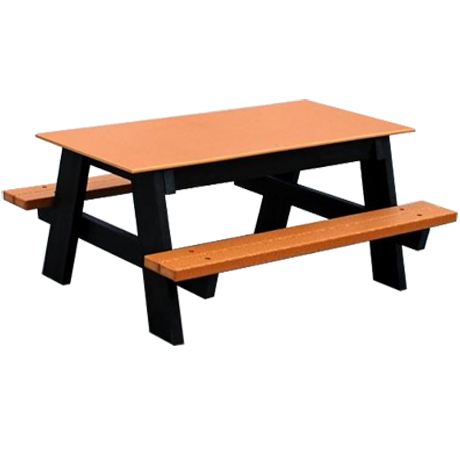 If you are looking for recycled plastic deck furniture, We carry full line of Adirondack Chairs, Dining chairs, Rockers, Tables, and Chaise Lounges. 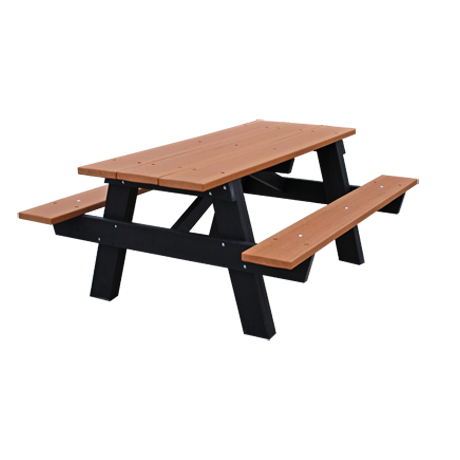 This deck furniture is made by craftsmen in the Amish Country of Pennsylvania. 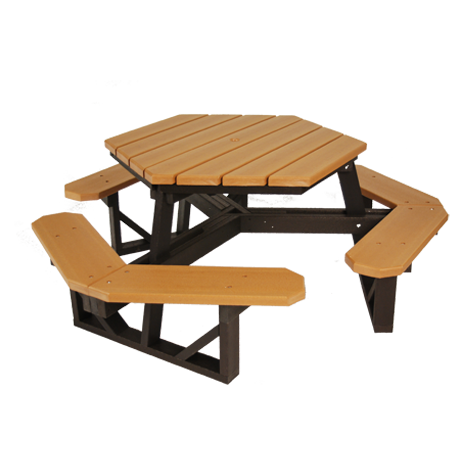 Call our friendly sales staff to help you choose the recycled plastic picnic table that is right for you! 6 ft. or 8 ft.